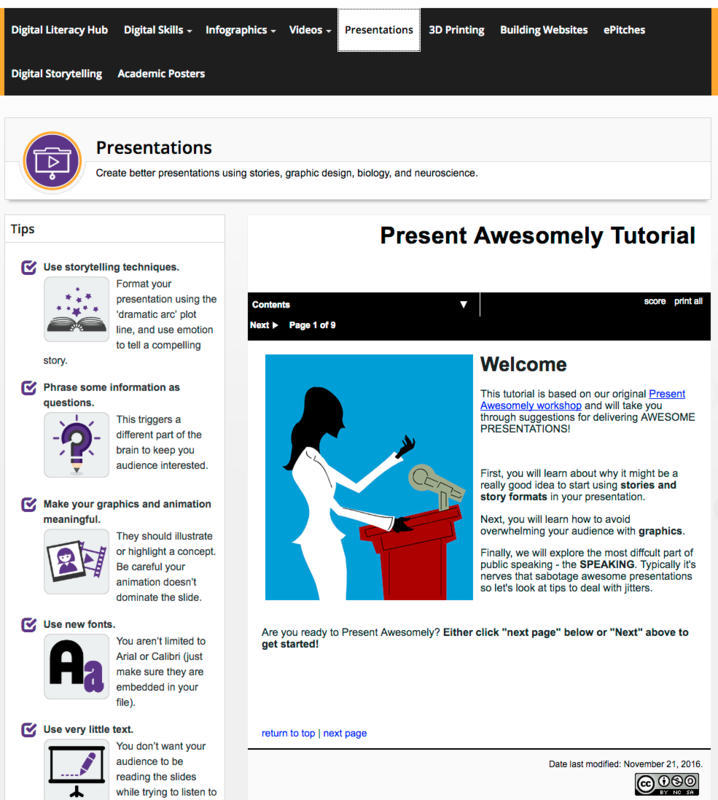 The Content Creation Kit is a resource page for anyone who is creating content for The Learning Portal. It includes guidelines for Portal content, and resources to help you create the content you will include. Hub Pages: Contains the description of the hub and links to the content pages or modules (if the hub requires modules). Module pages (optional): These page these pages are optional and should only be created if you have a lot of content with logical divisions, and it needs to be divided further. The hub page with the links to the modules. The module page with links to sub-module content pages. This PowerPoint gives examples of the typical layout of a hub page, a module page, and a content page. You can modify the document to help you plan the layout of your hub. This Word document provides a template for the list of content in a hub. Complete the template with the content for your hub. 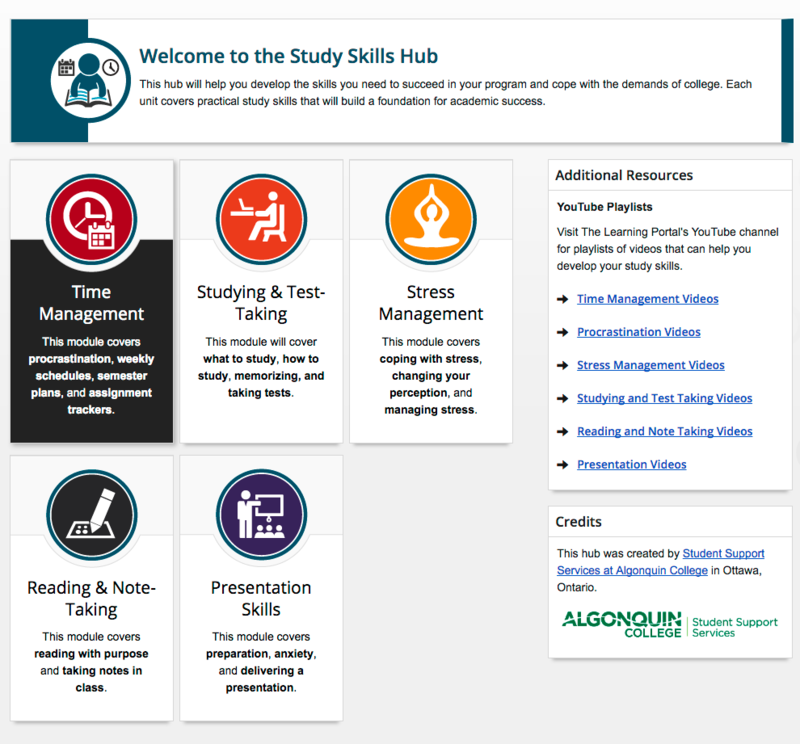 A Learning Portal hub is one of the major sections on the site, such as Study Skills, or Research. All learning resource content appears under one of these hubs. Some elements of the hub will be created by Algonquin College, while other elements must be provided by you. 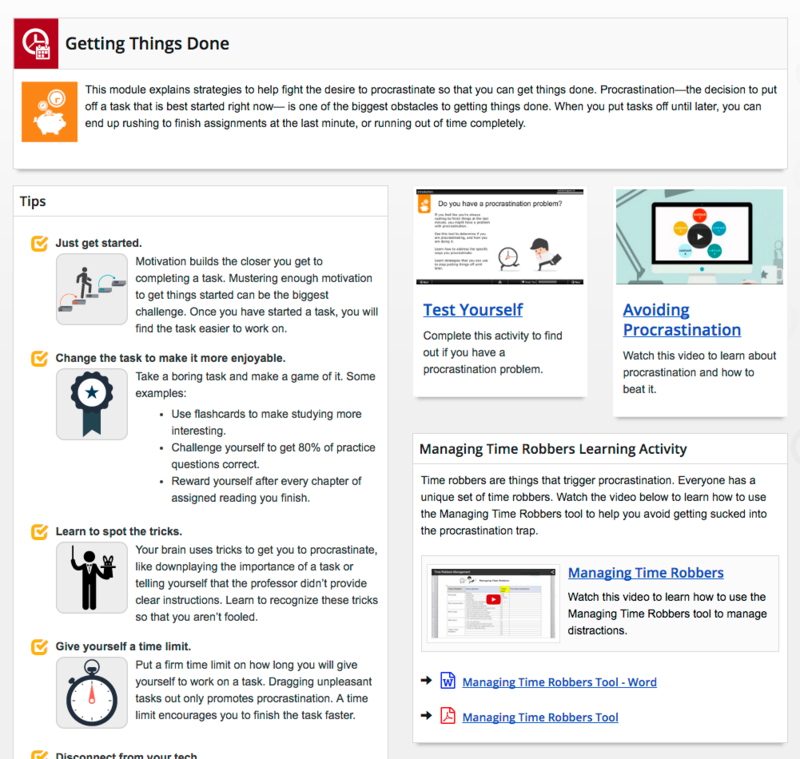 Hub pages include links to module pages or module content pages. A short description of the hub to appear on the Portal home page with the link. A introductory description of the hub that will appear at the top of the page. Name and description of each module in the hub. Additional resources or quick links. A credit box indicating that your college created the content. An icon and colour that represents the hub. A separate libguide for that hub where the hub content will appear. Icons and links to each module in the hub. Modules are sections of content within a hub. 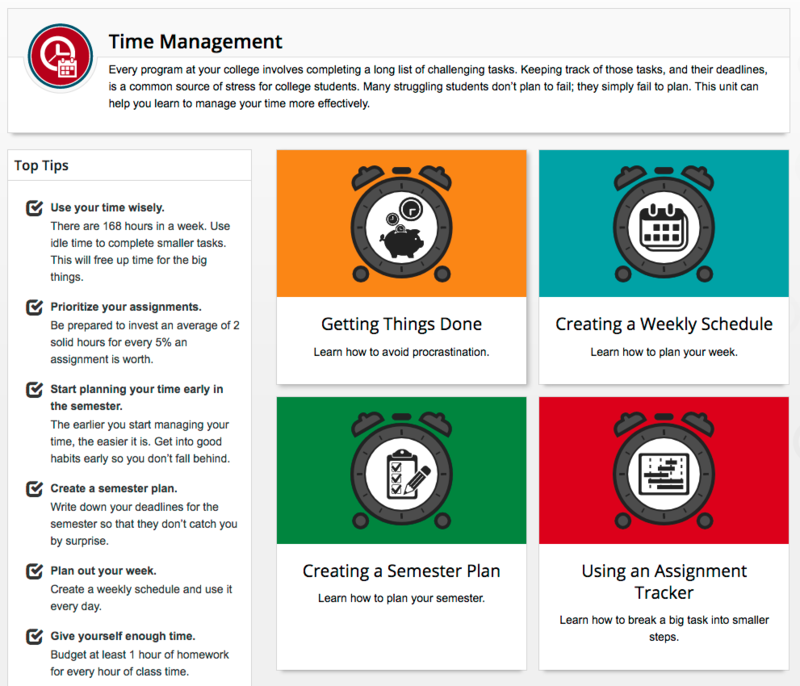 For example, the Study Skills hub has modules such as Time Management, and Reading and Note-Taking. Not all hubs require module-level pages. Modules act as an additional step between the main hub page and the content pages. They divide the content into smaller sections when there is too much content to link directly to content pages. If you are creating modules, some elements of the modules will be provided by Algonquin College and some must be provided by you. Tip heading (the main point of the tip, written in sentence case). Tip description which elaborates on the point. Icons and links to sub-modules from the module main page. As the name suggests, the bulk of your content appears on a content page. 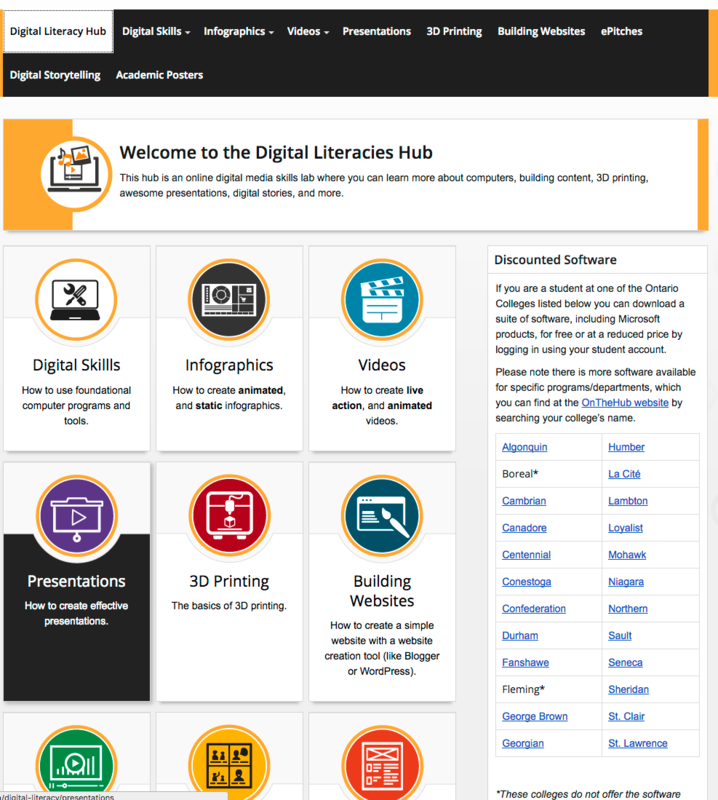 This is where you will include activities, videos, text, tip sheets, and other learning content that you want to include in your hub. Content pages can appear immediately after a hub page (module content pages), or after a module page (sub-module content pages). Some elements of the content pages will be created by Algonquin College, while the rest of the elements must be provided by you. Written content: instructions, tip sheets and other written content. Tip icons: Once you have provided tips, Algonquin College will create icons that correspond to each tip. Your content will be reviewed, and it will be revised for grammar and consistency to ensure that it fits within the guidelines of The Learning Portal. Use this checklist to ensure that you include all the elements required and meet the standards for content.